Over the past decade, Jeffrey J. Williams has been one of the most perceptive observers of contemporary literary and cultural studies. He has also been a shrewd analyst of the state of American higher education. How to Be an Intellectual brings together noted and new essays and exemplifies Williams's effort to bring criticism to a wider public How to Be an Intellectual profiles a number of critics, drawing on a unique series of interviews that give an inside look at their work and careers. The book often looks at critical thought from surprising angles, examining, for instance, the history of modern American criticism in terms of its keywords as they morphed from sound to rigorous to smart. It also puts in plain language the political travesty of higher education policies that produce student debt, which, as Williams demonstrates, all too readily follow the model of colonial indenture, not just as a metaphor but in actual point of fact. 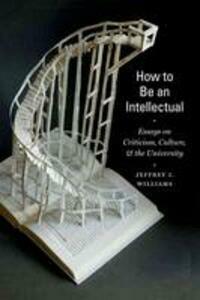 How to Be an Intellectual tells a story of intellectual life since the culture wars. Shedding academic obscurity and calling for a better critical writing, it reflects on what makes the critic and intellectual-the accidents of careers, the trends in thought, the institutions that shape us, and politics. It also includes personal views of living and working with books.